When earlier today we reported that Turkey has closed the airspace above, and suspended all US-led air missions out of the giant Incirlik airbase (which houses some 50 US nuclear bombs), we said that there is speculation the “airbase may be held “hostage” by Ankara as a bargaining chip ahead of demands for the extradition of Erdogan’s arch enemy, Fethullah Gulen, currently a resident of the state of Pennsylvania.” A few hours later this was partially validated when during a televised speech, Turkish President Erdogan called on the United States to extradite Fethullah Gulen, a US-based Muslim cleric he accuses of being behind Turkey’s failed coup attempt. At roughtly the same time, Turkey’s Minister of Labor went one step further, and accused America of being behind the coup on live Television, as it was harboring Gulen. None of this mattered to Erdogan who said as Turkey’s strategic partner, Washington should meet the demand for the extradition of Pennsylvania-based Fethullah Gulen. 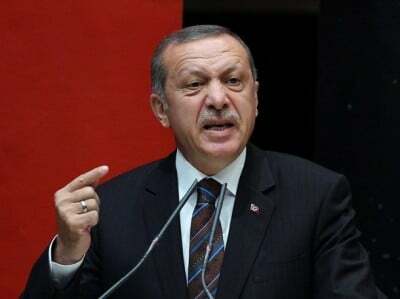 He also added that Turkey had never turned back any extradition request for “terrorists” by the United States, implying it is the US imperative to extradite the man Erdogan accuses of starting last night’s failed coup. The revisionist narrative spun by the Turkish government, goes as follows: a faction of the armed forces, deemed by the government as loyal to Gulen, tried to seize power using tanks and attack helicopters overnight. As we learned previously, one hundred and sixty-one people were killed, including many civilians, in the ensuing violence. Allegedly up to 3,000 soldiers have been arrested, a paltry figure in comparison to the total size of the Turkish army, recently estimated at 315,000 personnel. Cavusoglu said the military now needed to be “cleansed” of Gulenist influence. “Once this cleansing is finished our military will be stronger, our soldiers will be stronger, providing better support and coordination to NATO,” he said. In an indirect hint that the Incirlik airbase may indeed be held hostage, the minister said soldiers at the base in southern Turkey, used by the U.S. military to conduct air strikes against the Islamic State, had been involved in the coup attempt and that arrests had been made. “Once these operations are completed, we will continue our fight against Daesh (Islamic State) with either coalition nations, or within the NATO framework, and resume our cooperation with NATO,” Cavusoglu said. But not sooner, and perhaps the delay may last as long as it takes for the US to respond to the extradition request. As AP adds, a Turkish official, speaking on condition of anonymity in line with government regulations, said Turkey “has been preparing a formal application with detailed information about Gulen’s involvement in illegal activities. After last night we have one more thing to add to an already extensive list.” And, more to the point, no formal extradition request has been made yet. Which means that Erdogan may be merely doing more of what he is so good at: populist pandering while using foreign scapegoats to further cement his authoritarian status. Furthermore, the truth is that Erdogan has little to gain from the extradition of Gulen, who has absolutely zero responsibility for what is increasingly likely a self-orchestrated coup. As we said earlier today, it benefits Erdogan far more to keep Gulen in the US – where he can use him as a perpetual scapegoat to “justify” his relentless power-grab – than to bring him home where his trial (and execution) would eliminate one of the biggest pretexts Erdogan has to be openly paranoid in public, and demanding ever more power. John Kerry responded that the Obama administration it would entertain Gulen’s extradition request,but he said Turkey’s government would have to prove Fethullah Gulen’s wrongdoing. Visiting Luxembourg, Kerry said Turkey hasn’t yet requested that the United States send home Gulen, who left Turkey in 1999. “We haven’t received any request with respect to Mr. Gulen,” Kerry told reporters. “I’m confident there will be some discussion about that,” Kerry added. We are confident that once the initial bluster passes, there will be no formal extradition request, and even if there is, Gulen will stay in his home in rural Pennsylvania: after all Erdogan has absolutely nothing to gain from such a move. Meanwhile, in other news, Turkey’s Third Army Corps, Akin Ozturk, who was appointed as head of the Turkish air force in 2013, has been detained and will face treason charges, Reuters reports, citing a Turkish official. Local media have named Ozturk as the likely leader of Friday night’s coup attempt in Ankara. Also detained by the Turkish police was Alparslan Altan, a member of the Constitutional Court and most senior judicial official among the scores detained so far in the wake of the attempted military coup, CNN Turk reported.